Breast augmentation is a surgical procedure designed to provide a woman with a volume-enhanced, aesthetically ideal breast profile. 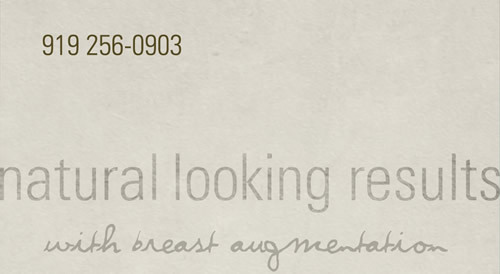 Truly beautiful breast augmentations are those that remain natural-appearing. Women interested in breast augmentation may have never developed breasts that are in proportion with the rest of their body, or they may have experienced a loss of breast volume after having children. In either situation, breast augmentation with cohesive silicone gel or saline breast implants can provide an ideal breast contour and create or restore harmony for a woman's figure. Dr. Michael Law is a board cerified plastic surgeon in Raleigh North Carolina offering breast augmentation surgery and well known for providing natural looking results with both silicone gel and saline breast implants. Dr. Law's aesthetic ideal is natural appearing breasts that are in proportion to the rest of a woman's body. In order to achieve a natural appearance each patient must be evaluated individually, and a number of factors must be taken into consideration. During a breast augmentation consultation, details including the type of breast implant, breast implant size and profile, breast implant position and overall patient expectations will be discussed. Information about breast implants can help to answer some questions before your in-office consultation with Dr. Law. Prior to breast augmentation consultation most women are interested in viewing breast augmentation before and after photos, in order to get some idea of results they might hope to achieve. This is perhaps the best way to ensure that your surgeon's aesthetic vision matches your own. When thoughtfully planned and carefully performed, breast augmentation surgery can have a profoundly positive effect on a woman's quality of life and self-esteem. Dr. Michael Law offers information on silicone gel and saline breast implants and cosmetic surgery procedures on LookingYourBest.com.